The PR-2000 shows no display screen & the phase lamps DO NOT illuminate. Check that the wall & cabinet breakers are on. The PR-2000 shows no display screen & the phase lamps DO illuminate. Check that the display screen has power & the phase lamps are on. 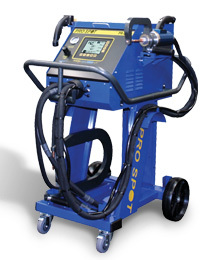 The PR-2000 makes a weak weld. Check gun setup: squeeze pressure, shank & arm, tip condition & alignment. Check metal prep & condition as well as thickness.